General: Sumac family (Anacardiaceae). Straggling to upright native shrubs 0.5-2(-2.5) meters tall (rarely tree-like), forming colonial thickets of up to 10 feet spread, suckering from the roots, the branches slender ascending, puberulent, glabrate, or densely pilose; buds naked, tiny, yellow, hairy, surrounded by a raised, circular leaf scar. 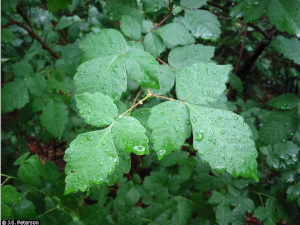 Leaves: deciduous, alternate, compound with 3 leaflets, variable in shape, lobing, and margin, the leaflets unstalked, ovate to rhomboid, more or less wedge-shaped at the base, coarsely-toothed, usually shiny-glabrous above, the terminal leaflet 3-6.5 cm long; summer foliage green to glossy blue-green, turning orange to red or purple in the fall. Flowers: yellow, in small, dense inflorescences on short lateral shoots, opening before the leaves, bisexual and unisexual, both types borne on the same plant (the species polygamodioecious); male (staminate) flowers in yellowish catkins, female (pistillate) flowers in bright yellow, short panicles at the ends of branches. Fruits: 5-7 mm in diameter, bright red at maturity and densely hairy, containing a single nutlet 3.8-4.5 mm long, in terminal clusters. 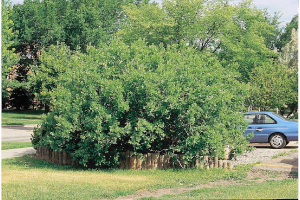 The common name "sumac" is from the Middle English for related tree. The leaves are fragrant or at least odorous.